Chicago Art Department is pleased to present 25 artists from around the world, all exploring the iPhone as creative tool. Whatever iPhone art means to the larger art world is up for debate. Some see it as a powerful art making tool while others see nothing more than a phone. While the debate goes on, fine artists everywhere are making, sharing, and selling iPhone art. You can find iPhone art on the cover of print publications and online, also in galleries and in private collections. Wherever this device ends up inside of the fine arts landscape, there's a strong case to be made that the iPhone is at worst a flexible, powerful, and convenient new tool for contemporary artists. "iPhone Therefore I Am" is the culmination of a class led by Chicago artist Mike Nourse, offered by the Chicago Art Department which features ten local artists who met weekly, working towards a completed project in areas such as photo, digital sketching (finger painting), animation, sound, and video. In addition to local artists, CAD program coordinator Mike Nourse brought in national and international iPhone artists from as far away as Russia, Norway, Spain, France, and Germany. The end-result is a comprehensive look at this digital tool and some of its artistic possibilities. The timing to examine this device plays a large part in this exhibition. Chicago artist Jon Satrom feels the show is "situated in a critical time-space where media-making tools are forking from traditional operating systems to mobile devices and artists are crucial in these transitions." And In an era where time matters more and more, the iPhone as creative tool presents a convenience that many other tools simply can't. Artist Mia Robinson from Washington D.C. says, "I use an iPhone to make artbecause its the one tool that's always there." This exhibition has brought together a wide range of artists from around the world, all excited to be a part of iHistory. From Spain, artist Luis Peso describes how this show has "opened a door to the amazing iPhone Art from several diferent countries around the world!" Matthew Watkins (Germany) feels that "this show is further confirmation ofthe importance of mobile and iphone art. It's anepochal moment," From America, David Lebowitz is an east-coast artist who is writing a book on the subject and will be showing one of his finger-painted pieces. He says "artists like myself were drawn to it like moths to a flame. I'm proud to be part of this exhibition, among the first on planet earth to feature pioneering, international efforts of this 21st century medium." Where is iPhone art heading? What type of artists work with an iPhone and when? Why? How does the iPhone fit into the contemporary art landscape? This exhibitions takes a step towards the answers. 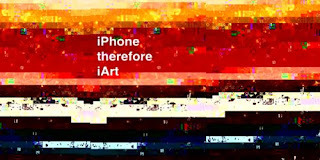 "iPhone Therefore iArt" features Chicago artists Jon Satrom, Carl Sweets, Alyssa Sorresso, KirkBravender, Melissa Porter, Mike Nourse, Seth Gershberg, Nathan Peck, and Nat Soti. Artists from beyond Chicago include David Leibowitz (Teaneck, New Jersey), Russ Croop (Boulder, Colorado), Mia Robinson (Washington, DC), Susan Murtaugh (Two Rivers, Wisconsin), Sandra Schmidt (Livonia, Michigan), Julia Kay (San Fransisco, California), Matthew Wadkins (Italy), Benjamin Rabe (Germany), Joseandrés Guijarro Ponce (Spain), Luis Peso (Spain), Alexander Lysov and Timofey Caraffa-Corbut (Russia), Cédric Phillippe (France), Thierry Schiel (France), Rino Larsen (Norway), and Patricio Villarroel(France). Thnx for posting Miguel! I look FWD to seeing you there! !